After some delay, here's a translated script of the third Volume of Suigintou's "Koyoi mo Ennu~i" ("It's Ennui Again, Tonight") - the notional radio show hosted by the first doll of the Rozen Maidens, and, increasingly, by her Medium Megu. Where are the full translations for Volumes 1 and 2, you ask? D-don't get so full of yourselves! I... i-it's not as if I care about you or anything...! ...Well, I feel a little tsundere for doing this one even though I said I hated the radio shows. I did omit a translation of the lengthy last track, which is just the voice actresses out-of-character, getting unbearably giggly and yammering on vapidly about what they plan to do for Christmas, etc. Sorry if you really enjoy that sort of thing. I'm also experimenting with leaving out the timing data for each line, since it takes a while to do and I'm not sure that it's of any use to people - from what I can tell, most of you are just reading it on its own without the audio to accompany it. At any rate, I don't think it should be that easy to lose your place. Let me know if you need it and I'll consider adding it later. 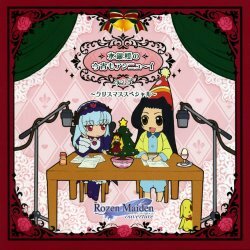 By the way, there is another Rozen Maiden "Christmas Special" CD due later in December, not to be confused with this one. From appearances, its more along the lines of the first TV and Traumend dramas - that is, a somewhat more canonical type of original story featuring more of the show's characters. I plan to get a translation up for that one as soon as I can after receiving the CD. As always, please email me if you have any corrections you think should be made to the script. I was a bit uncertain in some parts due to the references to Japanese pop culture or anime and internet memes. Download a plain ASCII version (*.TXT) of the entire script here (47 KB).